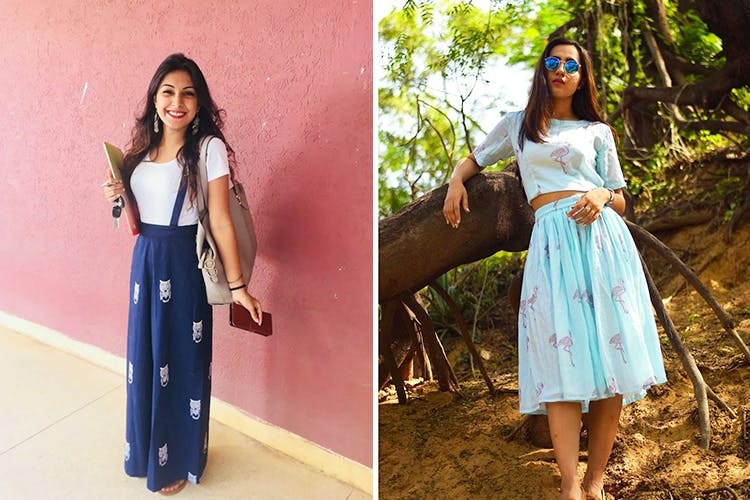 Fancy Pastels is a brand that's using traditional methods like tie-and-dye, block-printing and weaving to create gorgeous clothing for men and women. From peplum tops to printed shirts to dungarees pants, they have a lot of cool stuff on their site. Petite sizes, colourful clothes, quirky prints and comfortable material. We asked a few colleagues who've ordered their stuff, and discovered they cater to all sizes, but are winning for their XXS and XXXs, so you can skip that extra trip to the tailor. The fit is great and they have a range of semi-formal workwear that you can wear to work and otherwise.They have dungaree pants and skirts, printed jackets, flared dresses, co-ords and jumpsuits. We liked their flared trousers from the 70s, linen culottes and cigarette pants. They have some really nice printed shirts, jumpsuits and dresses like the owls on the dungaree pants, and autos and cycles on the mens shirts. They also have a cute pineapple print that they're using on shirts and dresses. We wish they had more options for their clothing—they have a lot of the same prints for different clothes. Their pants are the clear winners here, so if you're looking for what they do best, that would be it.